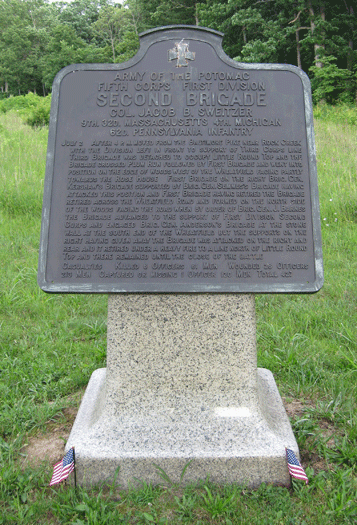 The brigade was commanded at the Battle of Gettysburg by Colonel Jacob B. Sweitzer, an attorney from Pennsylvania. July 2. After 2 P. M. moved from the Baltimore Pike near Rock Creek with the Division left in front to support of Third Corps line. Third Brigade was detached to occupy Little Round Top and the Brigade crossed Plum Run followed by First Brigade and went into position on the edge of woods west of the Wheatfield facing partly towards the Rose HouseFirst Brigade on the right. Brig. Gen. Kershaw’s Brigade supported by Brig. Gen. Semmes’ Brigade having attacked this position and First Brigadehaving retired the Brigade retired across the Wheatfield Road and formed on the north side of the woods facing the road when by order of Brig. 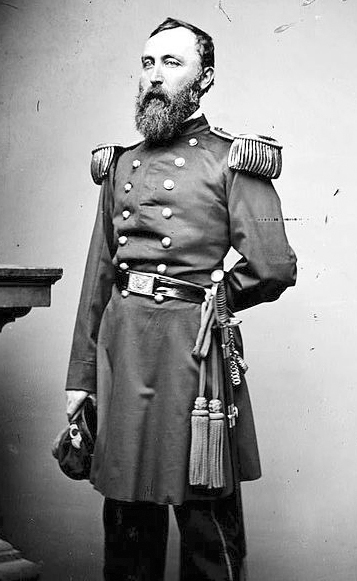 Gen. J. Barnes the Brigade advanced to the support of First Division Second Corps and engaged Brig. Gen. Anderson’s Brigade at the stone wall at the south end of the Wheatfield but the supports on the right having given away the Brigade was attacked on the right and rear and it retired under a heavy fire to a line north of Little Round Top and there remained until the close of the battle.